Cincinnati-based BiLT Architects designed, developed and rehabbed the 1870s tenement building to fit what they called a modern urban lifestyle. They were able to do this by retaining original architectural details, while also responding to new trends in Cincinnati’s rapidly growing bicycling community. Located at 512 E. Twelfth Street in Pendleton, the seven-unit development offers an unparalleled amount of amenities for bicyclists looking to take advantage of the building’s central location. On-site, the property has dedicated bike lockers and a fully outfitted bicycle workstation with bicycle stand, pump, and repair tools. Tenants can also purchase 50% discounted memberships to Cincy Red Bike, connecting them to a network that has grown to 385 bikes at 50 stations throughout Cincinnati and Northern Kentucky. These efforts have earned Abigail Apartments the distinction of being the first apartment building in the city to be named an official “Bicycle Friendly Destination” by local advocacy organization Queen City Bike, of which Abigail Apartments is also a member. The project does not have dedicated on-street parking, but this has not been an issue for prospective tenants. For example, the developers say, some people with employer-provided parking downtown have said they might leave their car parked at work and instead walk and bike for their other trips. BiLT Architects’ Andre Bilokur said that he and his partner, Patricia Bittner, designed the project with people like their daughter in mind – renters who work in the center city want to live a car-free or “car-lite” lifestyle near all of the action, without sacrificing affordability or good design. More broadly, they expect the project to appeal to people on either side of having a family – young professionals and “never nesters”, or empty nesters, much like Andre and Patricia themselves, who also live and work in Over-the-Rhine. 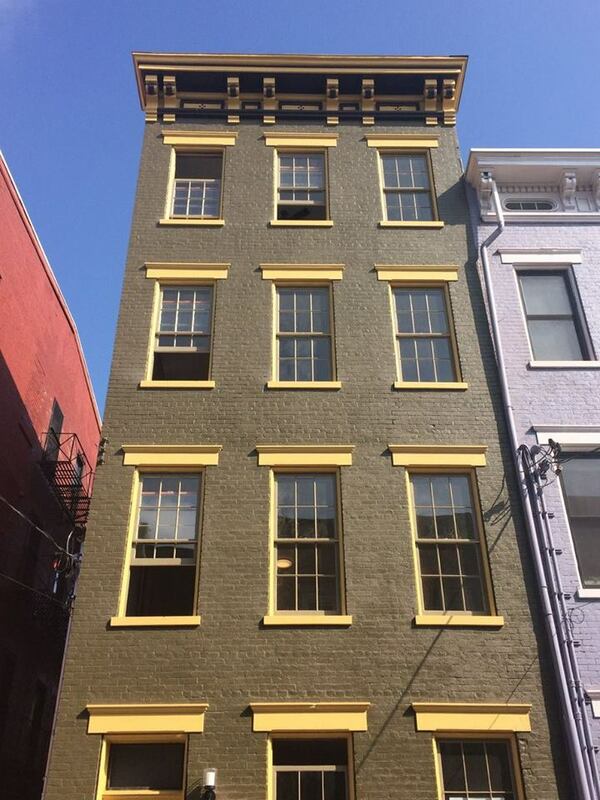 BiLT purchased the property in late 2014 from OTR A.D.O.P.T., and, thanks to a tax abatement from the City of Cincinnati and an Ohio Historic Tax Credit, they were able to restore the structure and preserve many features of the original tenements, including refinished hardwood floors, restored windows, room layouts, and even privy closets. Accent patches on the walls also cleverly reveal old layers of plaster from former occupants. The apartments began pre-leasing in April and will welcome the first residents in the coming weeks. Rents range from $840 to $880, or $1.50 to $1.60 per square foot. This is BiLT Architects’ second adaptive reuse project in the area, following a townhouse project they designed and developed 1431-1435 Elm Street. Andre and Patricia say more such projects are in the pipeline, including a set of commercial properties currently under construction near the townhomes on Elm Street. They say that these are expected to come on line by the end of the summer. A future phase at 1437 Elm Street will add a new construction, single-family home between the townhomes and commercial properties.